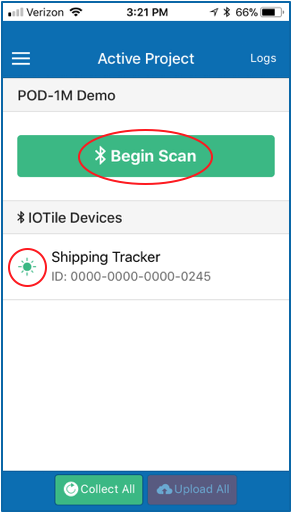 These instructions give the user a quick overview of how to connect the battery and then use Arch System’s IOTile Companion Mobile App to make sure that the POD-1M Shipping Tracker has powered up correctly. Loosen the screws enough to open the POD-1M lid. The screws do not have to be removed entirely and can remain connected to the lid. Snap the battery wiring clip into the connector on the bottom board as shown in the image below. The red wire is closest to the ribbon cable. If you already have an IOTile Companion App account, skip to step 6. Have a company (organization) administrator send you an invitation to your company account or email help@arch-iot.com to get access your company account. All devices are associated with a company account, and you have to be a member of that account to connect to the device. Click on the link in the introductory email and create your account. Download the IOTile Companion App from the iOS or Android App Store. Login to the app using the account information from Step 3. Click on the company project. If there is more than one company project, ask which one you should be using. If a green star appears to the left of a device listed, it’s within Bluetooth range. If it’s not, make sure you are within range (20 feet). Compare the device ID listed on the side of the POD-1M that you just installed the battery to the device ID’s shown in the mobile app. If the device ID’s match and you have a green star next to the device, the POD-1M has powered up correctly.